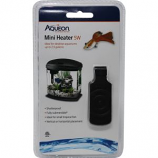 • All Aqueon Heaters Are Guaranteed For Life. •With a highly visible dual digital LED display, the DDC-800 includes adjustable high and low temperature settings with audio alerts. •For fresh or saltwater systems.